Monitoring for HABs and Invasive Species with the FlowCam at Big Bear Municipal Water District. Big Bear Municipal Water District (BBMWD) is a small water utility located in Big Bear California. The MWD is responsible for the overall management of Big Bear Lake, one of Southern California’s premier recreational lakes. BBMWD’s recent purchase of a FlowCam allows them to quickly monitor for harmful algal blooms (HABs) and invasive quagga and zebra mussels. Maintaining healthy algae populations and preventing HABs are a priority for BBMWD. Foul odors, toxin releases, and wildlife deaths drive visitors away, as well as restrict the use of the lake. Shown at left is the Anabaena bloom with dead algal cells bleached out by the sun. HABs can bloom to toxic concentrations in a few hours. Prior to purchasing a FlowCam, BBMWD outsourced water quality analysis and it took up to one month to receive results, at which point the impending HAB had already bloomed and subsided. Thanks to the FlowCam, BBMWD receives results in minutes. BBMWD collects samples from 3 depths at each of the 4 locations to monitor the water column around the lake. Of the 12 samples, the majority are sent to the Department of Fish and Wildlife for invasive species monitoring to support early detection of invasive species. A portion of those samples are analyzed for quagga and zebra veligers in-house using the FlowCam. The FlowCam is also used for in-house analysis of algae and HAB monitoring. “As the seasons change, it is easy to increase sampling frequency [with the FlowCam] to keep up with the increased likelihood of blooms,” says BBMWD Lake Manager James Bellis. BBMWD also uses the FlowCam to quickly answer the questions of Big Bear Lake users. 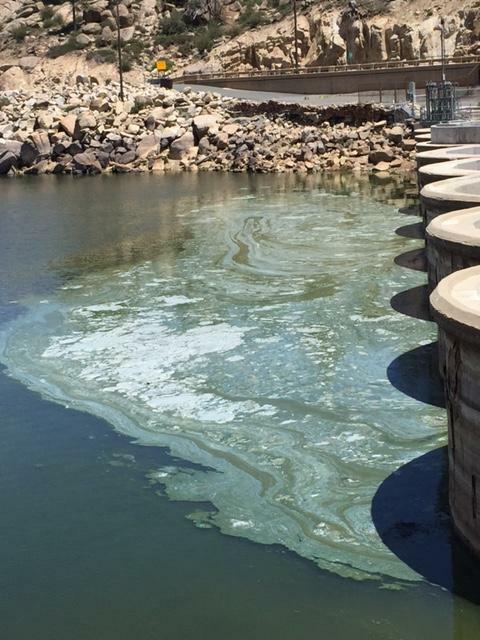 BBMWD often gets calls regarding algae from lake users. “It’s great that we can test the water and have confidence in the results.” Bellis says the FlowCam helps him obtain answers quickly and respond to calls with confidence. The FlowCam has empowered the BBMWD staff to educate the lake’s users on the environmental processes of lakes, what types of algae are good and bad, and when remediation is necessary. This spring, recreational lake visitors notified BBMWD of light blue algae present on the lake surface. 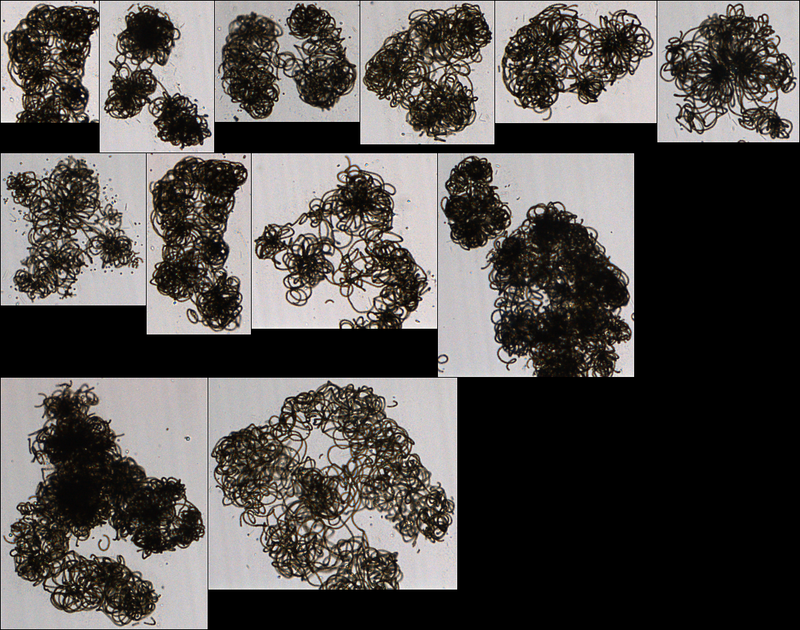 Upon imaging it with the FlowCam, BBMWD identified it as dead Anabaena sp. that had been bleached by the sun and therefore decided not to treat it with algaecide. Dead algae have a higher risk of lysing or splitting open as it dries out on the lake surface. If the dead cells had been lysed, say by an effort to mitigate them using algaecide, they may have released their toxins and posed a greater threat to the health of the lake. Shown at Right, Lake Manager James Bellis. The invasive quagga mussel threatens the health of fresh water bodies and any associated infastructure (pipes, etc.) The quagga mussel was recently discovered in Lake Mead, Lake Havasu and other Southern California lakes. Quagga mussels (Dreissena bugensis) and zebra mussels (Dreissena polymorpha) are invasive, biofouling mollusks capable of causing severe economic and ecological harm to freshwater habitats. Detecting presence of the mussels as soon as possible after their arrival allows managers to implement responses that can reduce further spread, such as watercraft movement restrictions. 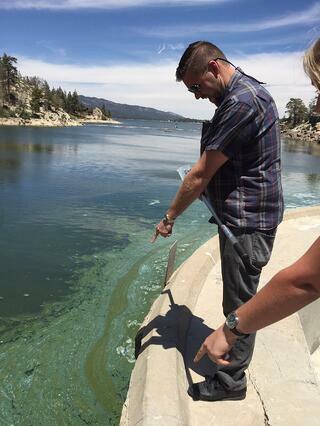 BBMWD has been taking the necessary steps to prevent the invasion of quagga mussels to Big Bear Lake since 2007. Educating the public on this invasive species and enlisting their help in education and prevention programs has been essential to protect the lake from the devastating environmental, recreational, and economic impacts of the quagga mussel. BBMWD received funding for the FlowCam through a grant from the California Division of Boating and Waterways to support the State’s efforts to manage and control HABs and invasive species like quagga and zebra mussels. The BBMWD is committed to improving early detection in conjunction with prevention and containment plans. They have created a strong program for educating the public around best practices to keep boats “Clean, Drained, and Dry!" Mussel veligers have unique shell morphology, shape and size that helps to identiy them. Consequently, when viewed by the FlowCam they are generally easier to identify.